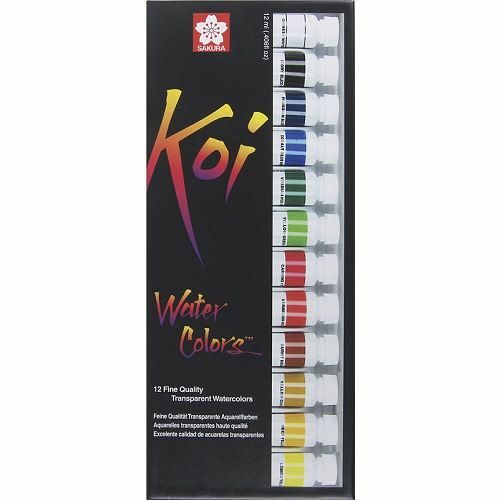 Set of 12 Koi Watercolor 12ml tubes vibrant colors. Koi watercolors contain a special binding agent and specifically selected pigments to create a superior watercolor paint. Includes Prussian Blue, Cobalt Blue Hue, Viridian Hue, Yellow Green, Carmine, Vermilion Hue, Burnt Sienna, Yellow Ochre, Deep Yellow, Lemon Yellow, Chinese White, Ivory Black.